Westgate School in Winchester is like many other Hampshire secondary schools: a solid and well-built main block dating from 1910. It’s been added to piecemeal, resulting in a messy and ill-defined campus, surrounded by temporary buildings which have now been there long past their projected life span. As part of the county’s programme for improving these schools, a cluster of huts was demolished. 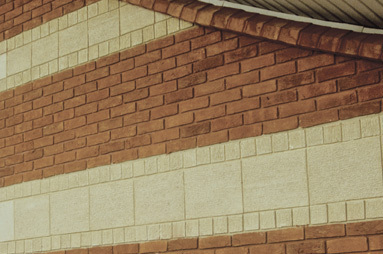 They were replaced with a permanent block facing the original Neo-Georgian brick building to form the first part of a large court at the centre of the campus. The addition of Blanc de Bierges products offered a welcome relief to the heavy dark brickwork. The horizontal bands emphasize the squat proportions of the building whilst providing a strong contrast to the stylishly shaped canopy. The new block had to make a strong statement against the original building, as well as capture daylight into the middle of the plan. The structure is very light – a row of tubular steel frames supports the ridge of glazing that brings light into the back of the row of south-facing classrooms. Curved roof panels are suspended from this row of frames, formed of double plywood skins stiffened with ply ribs, resembling aeroplane wings. The frames act as anchors to keep the winglike roof surfaces from taking off in a high wind, and at the same time, they make external arcades. The slope of the site on this side has been cut into a stepped plinth that provides seating for people who want to look at the games. The red sandfaced bricks of the plinth are carried up into the east and west walls of the building where they are banded with the classic Blanc de Bierges cladding to echo the 1910 building. 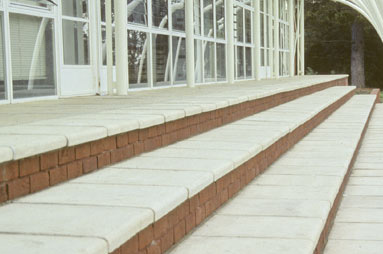 Traditional steps with red brick risers and Blanc de Bierges treads are incorporated into the paving – helping to reprise the wall claddings.